Managing Partner at Atomic Object Grand Rapids. 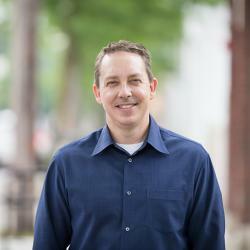 Passionate about technology, lifelong learning, and helping people. Ironman finisher and science geek. When I first entered the world of software consulting, I was a project manager at another firm. My job was to ensure that we delivered on the promises we made to our clients to make great software. In those early days, I felt project success required certainty in the scope, budget, and time frame. If the client’s expectations were clear and the budget adequate, we would deliver. I soon became frustrated that this seemed to conflict with what my sales team was trying to do. At times, it appeared to me that they only wanted to close the deal, and they were okay with sacrificing the needs of the development team. Projects were not funded with enough budget or time to meet the client’s goals. The result was pain and frustration for the client, which eroded trust. Developers felt they were not valued, and the sales team was on the defensive. The expectation was for salespeople to be away from the office more than in the office. They were to “knock on doors.” Deliver marketing materials. Do cold calls. Whatever they could to drive leads and keep developers busy. The sales job was hard because those hired to do it lacked technical skills. In a software product business, you can succeed with people who are good at the sales craft alone. The solution they are selling is well known. But in a software consultancy, where the solution is unknown, tech skills and experience are crucial. Without this, non-tech sales people are dependent on their developers. Developers are left having to convince clients in their competency. And they need to frame potential solutions with conviction. This is where the conflict occurred. Developers in this software consultancy had different incentives. They needed to bill and complete projects on time. Add in resentment for salespeople getting commission on deals closed by developers, plus a desire to avoid uncomfortable sales interactions, and it’s easy to see how this situation created pain and failure. This approach to sales is based on old ideas. 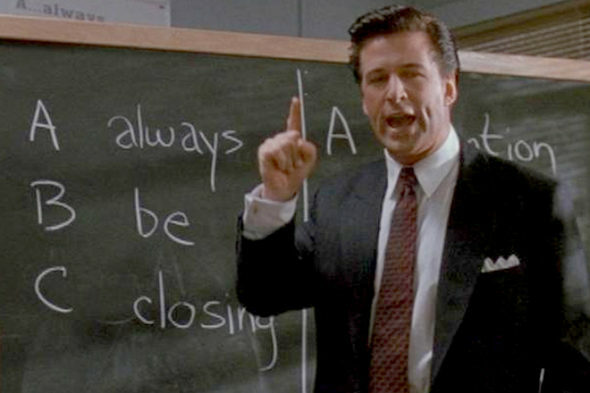 In the 1992 movie Glengarry Glen Ross, Blake (played by a young Alex Baldwin) instructs the middle-aged men on how to sell. He questions their masculinity and insults them with profanity. And then he writes three letters on a green chalkboard: “A—Always. B—Be. C—Closing.” It’s simple and memorable. Blake represents an idea of what every salesperson should be. Smooth. Tough. Embodying a take-no-prisoners approach. When I first saw this movie, I had an immediate dislike of all salespeople and felt sorry for them. I also had no interest in ever becoming one. The other old idea is that extraverts make the best salespeople. This seems intuitive since extraverts are sociable, likeable, and lively. Moving others requires interacting with others and being in social situations–something extroverts do naturally. Introverts find social situations draining. The problem with this idea is that there is no evidence that it’s actually true. Research by Adam Grant indicates that people in the middle of both extremes (ambiverts) have better sales results. As my role evolved and took on more responsibilities, I started to see this conflict, but I couldn’t put my finger on exactly what was wrong. I did believe that, contrary to what I heard, real sales is not magic. Strength of personality and personal relationships only get you so far. I believed everyone was part of the sales process whether they did sales or created the product. It seemed to me that success in software consulting sales was an art that relied on a scientific process. Since joining Atomic, I’ve become part of the sales team. My earlier thoughts and feelings about sales in a software consultancy have evolved. Atomic’s business follows the idea that helping others will drive our success. The sales team makes every interaction an attempt to help people, whether through education, defining a project, setting a budget, or building their product. And we are not afraid to connect people to someone else who can help them. The sales team uses a simple process with an emphasis on key practices and the right support tools. There is an effort to balance autonomy and control for sales decisions and activity. Above all, the practice is fundamentally human-centered. This idea really crystallized for me when we started reading Daniel Pink’s book, To Sell is Human. I discovered, to my amusement, that he redefines the ABCs of selling. To move others, you need to use the following approach: A—Attunement. B—Buoyancy. C—Clarity. Attunement is the ability to bring one’s actions and outlook into harmony with other people, and to do so within your current context. To accomplish this, you need to do three things. The first is to give up power since it causes individuals to anchor too heavily on their own point of view. This seems to be a weakness, but it turns out to be a strength because it allows you to take a different perspective. The second is to be able to understand what the other side is feeling, as well as what they are thinking. This is the idea of using both your head and your heart. The third is the art of mimicking others strategically. It is important that you do this subtly enough that the other person does not notice what you are doing. Top sales people are curious and ask questions to get into the core of what other people are thinking. They also operate with humility and take other people’s perspectives through reducing power. This doesn’t mean you have to be a pushover or act as a saint, just that you stay aware and open to those around you. Buoyancy is the art of staying afloat amid an ocean of rejection. This is the second essential quality in moving others. It starts by nurturing a positive view of yourself through effective self-talk, developing a confidence in your ability to solve problems and trusting your instincts. This isn’t just self-talk to give you an emotional boost. Instead, it’s asking yourself a question like, “Can I make a great pitch?” Research shows this gives you a confidence that is deeper and lasts longer. It also helps to recognize that rejection is temporary and specific, not personal, and to realize that people perform better when motivated from an internal choice. In the long term, outside pressure will fail to drive them with consistent success. It took me a long time before I learned these lessons. Finally, clarity means transforming from problem solving to problem finding. This is a central attribute in moving others. Selling today depends on the creative skills of an artist to find the real problem–not on some algorithm or a technical approach to solving a problem. For a software consultancy, knowing what good software you should create is key–not how you produce good software. This turns the past definition of a good salesperson upside-down. It’s no longer about being the best at accessing information about a product or topic. The best salespeople are skilled at finding the right problems and aligning solutions. They must be good at asking questions, listening, and uncovering new possibilities. Furthermore, clarity is dependent on contrast. Thus, to achieve it, you must ask: Compared to what? Less frame – Frame options in a way that restricts choices to help the buyer see what’s available more clearly. Experience frame – Highlight how the offering tells a story that makes connections with others that deepen our identities. Label frame – Assign a positive label to one option to elevate that choice when compared to the labels of the other choices. Blemished frame – Add a small blemish to your offering to enhance its true beauty and make it more real compared to other options. Potential frame – Instead of fixating on what was achieved, focus on the promise of what could be achieved in the future. Once the problem has been defined and the different options framed, it’s time to move forward. End with clearly defined action steps. Without defined action, clarity on how to think will not translate to moving people. Working at Atomic has been extremely rewarding. I’ve learned that my past thoughts about and concerns with the old idea of sales were justified. Thankfully, there is a different approach–one which treats people with dignity and honesty. And this approach has a proven successful track record. Atomic Object is a marketing-driven sales organization. This means our efforts around sales are less about finding “leads” and more about helping people find success for their business. We work to eliminate information asymmetry through educating our buyers. Our Pre-Project consulting model is designed to find the right problem to solve, and we make sure we are the right company to help. This approach to sales creates great internal alignment between our sales team and makers. It means we treat people with dignity, staying humble and recognizing that we don’t have all the answers. If we do work together on a project, you can count on us doing everything we can to make it a great experience for you, the buyer.